The opening reception for the US Consulate photographic exhibit “Between Friends: 65 Years of Bermudian-American Diplomatic Relations” took place last night [Mar 1.] at the Masterworks Museum of Bermuda Art in the Botanical Gardens. The exhibit, which will run through March 14, consists of 26 photographs of US presidential visits to Bermuda, beginning with President Harry Truman’s vacation cruise to the island in 1946, and Bermudian Premiers visits to Washington, DC. Bermuda’s proximity to the United States has made it the site of a series of summit conferences between British Prime Ministers and US. Presidents. The first meeting was held in December 1953, at the insistence of Britain’s Prime Minister Winston Churchill, to discuss relations with the Soviet Union during the Cold War. Participants at the conference included Churchill and US President Dwight D. Eisenhower [the two men are pictured together above at the Mid Ocean Club, site of the meeting] along with French Premier Joseph Laniel. 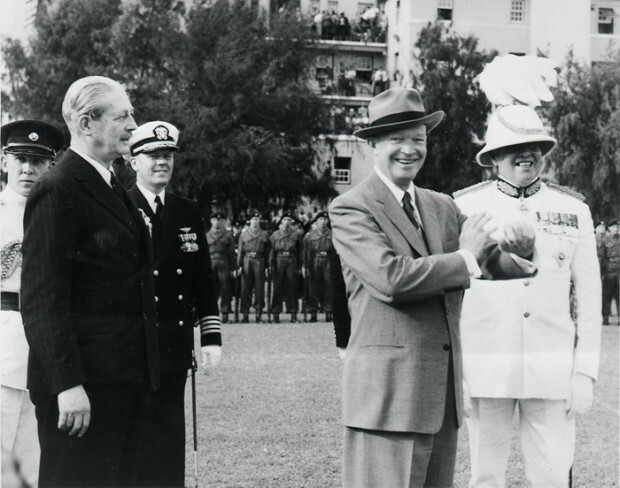 In 1957, a second Bermuda summit conference was held; this time British Prime Minister Harold Macmillan arrived earlier than President Eisenhower, to make it clear that they were meeting on British territory, as tensions were still high regarding the previous year’s Anglo-US conflict over the Suez Canal. “Ike himself suggested Bermuda as the place, feeling that it might help soothe the British hurt feelings to hold the conference in British territory,” reported “Time” magazine. “From the start, the tone of the meeting was cordial. Macmillan was waiting at dockside with outstretched hand as the President, arriving in Hamilton Harbour aboard the missile cruiser USS ‘Canberra’, stepped ashore from a US Navy launch. ‘Harold, how are you?’ Ike said warmly. 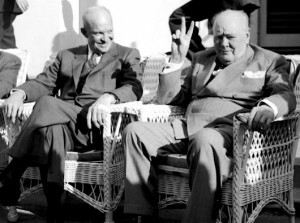 At the Bermuda meeting, President Eisenhower urged the British Prime Minister to set aside British anger toward Egypt’s president Gamal Abdel Nasser for nationalising the Suez Canal and recognise that restoring close relations with Cairo, while working to isolate Nasser internationally, would be more likely than outright hostility to serve Anglo-American interests in the Middle East. Eisenhower and Dulles also urged the British to consider Saudi Arabia’s King Saud as a potential regional rival to Nasser. 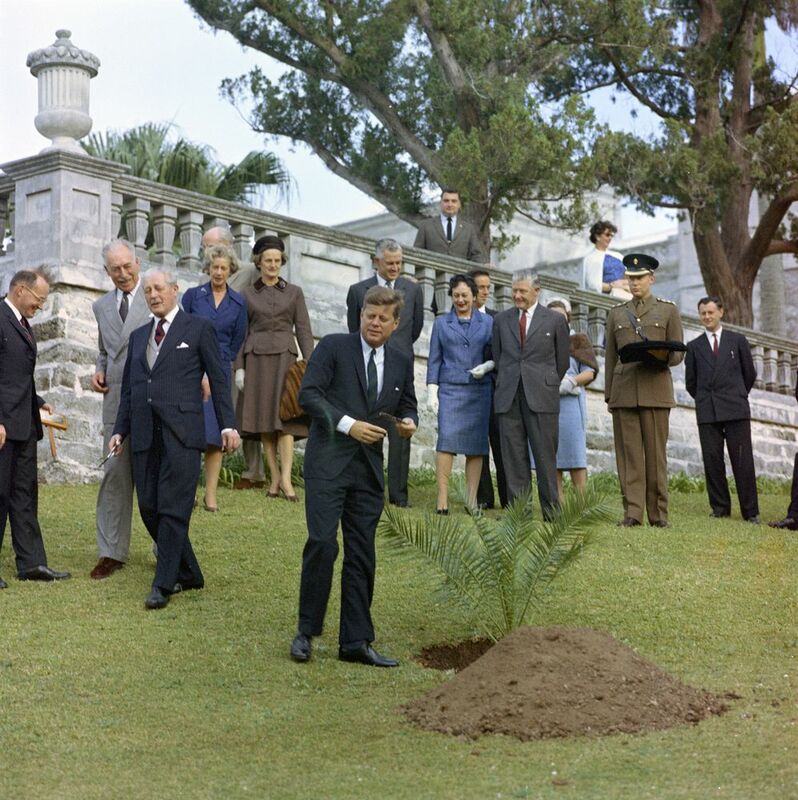 Macmillan returned in 1961 for the third summit with President John F. Kennedy, who was familiar with Bermuda, having made numerous personal visits. The meeting was called to discuss Cold War tensions arising from construction of the Berlin Wall. In 1971 US President Richard Nixon met in Bermuda with British Prime Minister Edward Heath to discuss the war then raging between India and Pakistan. As the two countries fought their third war since gaining independence in 1946, the US administration believed India was about to dismember Pakistan. While many observers viewed India as playing a helpful role against an oppressive military junta in West Pakistan [now Pakistan], led by General Yahya Khan, transcripts of the Heath-Nixon summit in Bermuda show it was more than that. Indian Prime Minister Indira Gandhi, on a visit to Britain, had told Heath of the pressure in her cabinet for her to take Pakistani territory and not return it. India, she said, had seen Pakistan tying itself to China and now the United States also was establishing links with Beijing with Nixon scheduled to visit the country in 1972 — the first US president to do so since the Communist regime had come to power in 1949. President Nixon’s friendly overtures to the Chinese, and their closeness to Pakistan, she said, had made it necessary for India to sign a treaty with the Soviet Union. Papers from the Bermuda summit show that President Nixon and his foreign affairs adviser, Dr. Henry Kissinger, suspected India of scheming not just the separation of East Pakistan [now Bangladesh], but the break-up of West Pakistan and even moves against the Pakistani side of the disputed Kashmir territory. The most recent Bermuda summit conferences between the two powers occurred in 1990 and 1991, when British Prime Ministers Margaret Thatcher and John Major met US President George H.W. Bush here. Direct meetings between the President of the United States and the Premier of Bermuda have been rare. The most recent meeting was on 23 June 2008, between former Premier Ewart Brown and President George W. Bush [pictured below]. 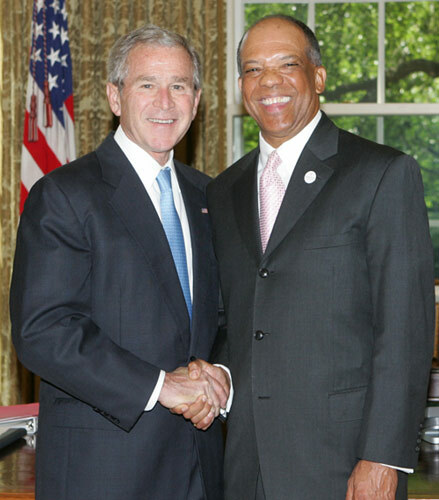 Prior to this, the leaders of Bermuda and the United States had not met at the White House since a 1996 meeting between Premier David Saul and President Bill Clinton. Prior to that Sir David Gibbons had met with President Jimmy Carter while Sir John Swan had conferred with both Ronald Reagan and George H.W. Bush on a number of occasions. At the Masterworks exhibit there will be formal photographs of American presidents in Bermuda to participate in international summits juxtaposed with never-before-seen informal photos such as President George Bush flying kites during his 1990 summit meeting with British Prime Minister Margaret Thatcher and President Dwight D. Eisenhower attending church. The presidential libraries provided most of the photographs and assisted with research. The exhibit pictorially represents the sustained and close relationship between the United States and Bermuda in the last half century.